This bar of Marabou Black Saltlakrits chocolate was listed under new products on the Ocado website, and sounded suitably curious to write a blog about. In fact when I say curious I mean I actually had to Google the name. Apparently this bar originates from Sweden and the name Saltlakrits means salty liquorice, which is an odd thing to combine with milk chocolate in my opinion. I opened up the wrapper and found a milk chocolate bar with some black pieces of liquorice shining through. I broke off a piece and gave it the taste test. It was a bit weird, that was my first impression and it was difficult to get past. 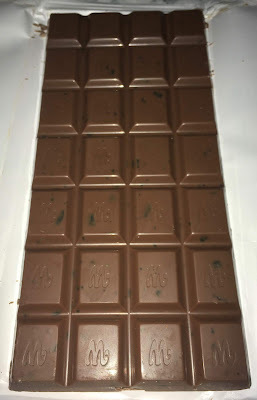 The chocolate has a very thick melt, and the the liquorice is crunchy. I hadn’t been expecting it to be hard, but the crispy texture was actually quite pleasant to eat. The flavour from the filling was very strong the liquorice was full and the salt was plentiful. By my third piece I started to really enjoy the curious flavour sensation and the mix of textures. The bar actually became quite moreish, and my tastebuds decided they liked the strong flavour sensation from eating the bar, that is from someone who isn’t a big liquorice fan. Who knew, the Swedish are right though, liquorice and salt work, and adding chocolate makes it magic!